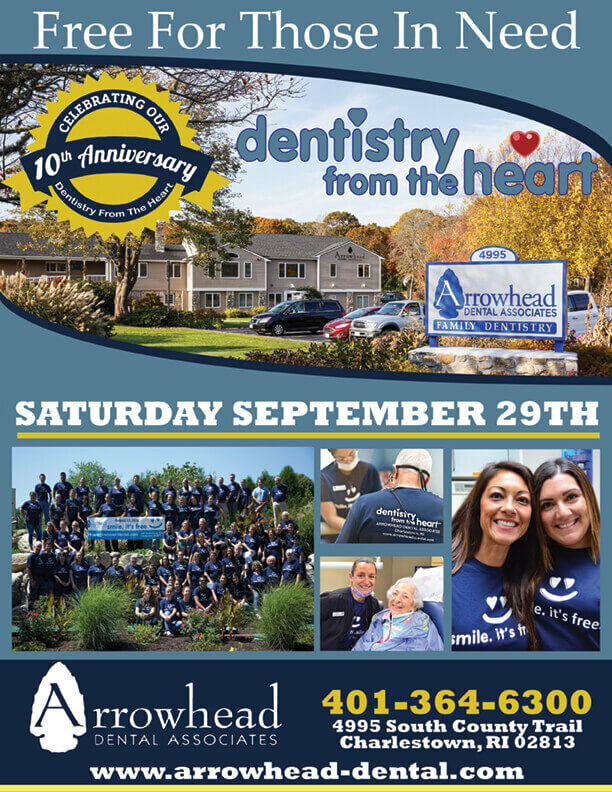 On Saturday, September 29, 2018, we will host our tenth annual “Dentistry from the Heart” event, a day of free dentistry for the South County community. This event directly affects hundreds of those in need, and this year we hope to host our biggest event yet! We will provide free dental care to those who cannot afford to maintain their dental health or have access to dental insurance throughout the entire day from 7:30 a.m. until 5:00 p.m. The event runs on a first come first serve basis so please arrive early for a spot in line. This is our way of giving back and to say thank you for our community’s support over the past forty years. We are always looking for local businesses and community members to help sponsor this big day! Please contact Alexander Prevey at marketing@arrowhead-dental.com for further information on how to get involved and support this free day of dentistry. We are always happy to answer any questions you may have about the event. Feel free to call our office at 401-364-6300 and one of our Patient Care Coordinators will gladly assist you. Please check in using the link below to let us know you are coming and see updates on this year’s Dentistry From The Heart.